Author Sam Love came to the attention of Conversations in early 2008 and has kept our attention every since. The 61 year old native of Aliceville, Alabama has taken his love of the 60s and brought readers an enjoyable, unforgettable tale in the book ELECTRIC HONEY. Though written years ago, the message and social issues it addresses are beneficial for every generation as you will see in this interview. • Sam, Thank you for taking out the time to talk with Conversations. Before we get into your book ELECTRIC HONEY, I want to talk about your desire to write. Where did it come from? Is it something you always knew you wanted to do? Thank you for the work you do promoting books. I’ve often wondered why I have a desire to write. Something inside me keeps pushing me. I am a mix of Scott and Irish and they have a great tradition of story telling. I have a feeling it is one of those genetic problems medical science can’t cure. • I am always curious as to what authors enjoy reading and how much it coincides with the time period they write about. What about you? If I was to visit you at home, what would I find on your bookshelves? I have always enjoyed the off beat. I loved “Gods in Alabama” for example or any of the books by Carl Hiaasen and Jodi Picoult. I just finished “The Diamond Cutter” about a Buddhist monk who goes to work in the diamond district in New York. I am also reading books now about the psychology of the workplace as research for another writing project. • ELECTRIC HONEY takes us through several generations, however, the main story takes place in the sixties. What was it about that time that drew you to it? I lived through the sixties and some of my friends didn’t. I also feel we are living in a culture where memory is disappearing. We are overloaded with noise and information and our brains are forced to shed anything they don’t need to function. I reference this in the Disclaimer in the front of “Electric Honey”: “Much of this story relied upon my memory of Mississippi in the 1960’s and since memory is disappearing from our culture, the story has all the accuracy of a fairy tale.” I have thought about making a bumper sticker that says, “Remember Memory”. I do think the sixties was a period that many people want to forget. Parents are not proud of some of the things they did. The conservatives have also attacked some of the alternative values young people explored during that time. The peace, women’s, and civil rights movements all opened up a Pandora’s box of questions about a white male dominated, materialistic and militaristic society. It led to clashes in the culture that are still happening. I heard a debate last night on TV about the role of alpha males in corporations. Much of this discussion I first heard 40 years ago. I even have a section in “Electric Honey” that describes a meeting where the women break off into a “consciousness raising” session on “sister power”. They discuss the role of women in the meeting and return to the main group with a list of demands. As they start listing their demands, some Neanderthals drive by in a pickup and fire a shotgun blast into the meeting. As odd as this seems today, it happened and I was there when the building got shot up in Mississippi. For years too many people voted with their shot guns in the state. • For those who are just finding out about ELECTRIC HONEY, give them a little bit of an overview as to what the book is about? I create an interesting cast of characters from the time. I first wrote the book from the third person perspective, but I couldn’t make it work—too dry. I then rewrote it from the perspective of a young woman struggling with some of these issues and her mother, who worked for a right wing conservative who attacks the youth revolution as a way to gain a political platform. So, I have two women characters on opposite sides of the cultural clash. Both of them are honest about their worldview. One is seeing her safe, conservative world challenged and the other is involved in questioning the old Southern culture. It gives me a classic protagonist and antagonist clash. Of course, they do have a bond and only time allows the daughter to develop more of an appreciation of her mother’s perspective. Interestingly enough this clash is still going on. I just saw a McCain commercial that talks about the excesses of the sixties’ hippies and how he represents the real patriotic America. This is right out of one of Colonel Billy’s speeches in “Electric Honey” (Colonel Billy is the right wing zealot who is the mother’s lover). One interesting thing about the current presidential race is that some people are too young to have experienced the culture war and none of this resonates with them. I actually thought we needed to parody the conservatives and get a good laugh at the absurdity of some of the things they believe. I actually wrote one of the love scenes as a military maneuver and some women wince when they read it, but I had never seen that in fiction before and I thought it might symbolically capture the ongoing battle between men and women. One interesting audience I never expected is young people who lived in Russia and the Eastern bloc. The book chronicles the anti-Communist phobia of the time (young people today don’t realize how “Communists” were the ultimate boogey men). I have had several people from Russia, Poland and Belarus read the book and they are fascinated at Colonel Billy’s anti-Communist rhetoric. • What stood out to me the most about the book, Sam, was the way the mother and daughter in the book weren’t as different as they might have seemed to each other. When you look at what is considered the “generational divide” today, do you think a lot of it is just because we don’t take the time to get to know each other? I actually think every generation rebels, but the cultural rebellion in the sixties was bigger and more challenging to the accepted social values. I don’t doubt that all of us have some of the same basic motivations and that developing a better understanding of each other can lead to more tolerance for the other’s views. I really see the “generational divide” today as a function of those of us from the sixties who are now getting too old to run things and leadership is being passed to a new generation who are facing some huge problems. Solving these problems is going to take all of us working together. We can’t afford any divides now. • There is an interesting story about the title of the book. Tell our readers about the supposed “Electric Honey” that was talked about between Bobby Joe, Peach and her mother. 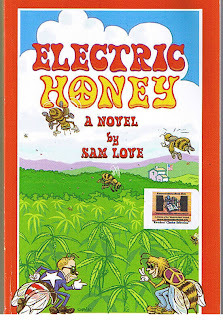 The title “Electric Honey” comes from a rumor I heard when I was a student in Mississippi that bees would fly through the fence that surrounds the government sponsored marijuana farm at the University of Mississippi and pollinate the plants. They would bring back the marijuana pollen and create a very special honey that shared the buzz. In researching the book, I found some references to bees doing this so it is likely true. In the book, this “electric honey” weaves in and out of the characters’ lives on both sides of the cultural divide. • In a world where perception is reality, what is the largest parallel you see between the world today and the world you write about? I am often amazed at the parallels. People are questioning the wars in the Middle East just like they did the Vietnam war. I just read a discussion that Obama may have to bring back the draft, which was a really contentious issue in the sixties. The recession is forcing some of the economic issues about women in the work place. It is also creating a collapse of the materialist culture. The fears of Communists are gone, but we have replaced it with a fear of Muslims and “terrorists”. It does seem like gays are making progress, but the cultural clash about sexual freedom is still with us. Some of the rumors being spread about Obama’s historic bid for the White House have echoes of the ugly racism of the fifties and sixties. • At the end of the day, Sam, what do you hope people take from ELECTRIC HONEY? I would love for someone to take away the idea that this would make a really entertaining movie that could give us a good laugh about some of the absurdities of the sixties. The book has already inspired a song by Tom Pacheco, “Big Jim’s Honey”, about a farmer whose honey sales take off because his neighbor is planting marijuana. It’s actually a great song, which audiences love. Maybe it will be the “Alice’s Restaurant” of the 21st century. “Electric Honey” is more of a fun-filled chronicle of a time that we are conveniently forgetting than a book with any serious idea that will save the planet. In the opening sentence Peach talks about how the book chronicles a time when “my life flirted with magic”. We could use a little magic now to pick up our spirits. • The book was originally released a couple of years ago. Are you surprised that it is still being talked and written about today? This book is a tribute to the fact that the publishing industry is undergoing radical changes. I think we are actually entering a “Golden Age” for poetry and fiction. We are seeing a parallel in publishing to what happened with film that allowed the “Indie Film Movement” to flourish. I first wrote the book about 25 years ago and after a number of rejections, it sat in the drawer. It was on a disc so old I could not find a computer that could read the document file, but a friend had an old one he was throwing out. It had an old version of WordStar on it and it read it. I then started work shopping the novel here in New Jersey and got some very good criticisms that led me to rewrite it. I was also encouraged that some women in New Jersey who write romance fiction were intrigued with the story. We all know what happened with the sixties in California, New York and London, but very little has been written about how it played out in the heart of the country in places like Starkville, Mississippi. Now with the changes in the publishing industry and the internet, it is possible to get “independent” fiction out. That makes this book possible. Otherwise, I would have gone to my grave with these wonderful characters trapped on a computer disc that archaeologists couldn’t read. We really are seeing a renaissance of poets and story tellers now and it is exciting. Your work with Conversations is a perfect example of sharing some of this excitement and helping unknown voices find an audience. Your work is critically important as bookstores close and newspapers cancel book review sections. I think the culture will be a better place for it. Keep on blogging. Nothing excites me more than when someone discovers the book and it resonates with them. One exciting aspect of today’s literary market place is that books can now have a longer life. They don’t have to be published and sell in one month before they are remaindered. You can now reach a world wide audience with the internet and that was impossible a few years ago. • Thank you for your time. If our readers want to find out more about you, the book and your upcoming projects, where can they find you online? Thank you for this opportunity. They can check my web site www.samlove.net or purchase the book on Amazon. Some sellers of used books are already trying to get over $50 a copy for some of the copies I have signed. This is either wishful thinking or they know it is odd enough it could be a collector’s item. Electric Honey was chosen as one of Conversations Book Club's "Top 20 Summer Reads of 2008". This is definitely one book you don't want to miss out on. Thank you Sam for sharing with us. We are better because of authors like you.